I recently found out that not everyone has had the pleasure of eating a popover! When I registered for my wedding (circa 2001) I had to have a popover pan. 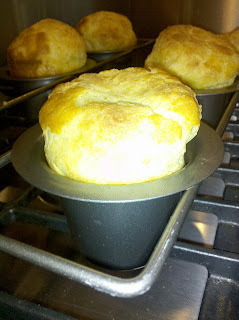 However, I think you can make popovers in oversized muffin tins as well. This recipe is so easy. The best part is that the top puffs up so much that you can pull off the top and serve a veggie inside (surprise!) or fill it with soup or just serve it all by its delicious self. Preheat the oven to 450 degrees. Spray your popover tin with cooking spray. Blend eggs, milk, flour, butter, and salt. Bake for twenty minutes. Reduce heat to 350 and bake for an additional 20 minutes. The kids love to watch these grow and grow and grow so I always let them cook in my bottom oven. Enjoy!